If you saw the popular 2003 film ‘Seabiscuit’, you might remember that the famous American racehorse had a difficult disposition until he was joined in the stables by another horse named Pumpkin. Pumpkin went on to accompany Seabiscuit everywhere, soothing his nerves and making it easier for his trainers to work with him. Companion animals of many species can have a calming effect on jittery mounts, who may take their cue from a more steadfast friend. Owners of nervous horses often resort to adding a companion or two to the stables to make travel easier, which is ideal if they show or race away from home. Horse companions are also wonderful to help equines weather the upheaval of moving or being rehomed, so they are popular with rescued and second career horses from the racecourse. Some horse owners reap multiple benefits from the companion animals in their stables. In addition to reducing anxiety, their camaraderie helps relieve boredom, which can in turn prevent naughty behaviour and stall vices such as cribbing. Companion animals can even provide protection for their horse friends. Mustang owner Shelley von Badinski, who lives outside Los Angeles near the foothills of the San Gabriel Mountains, is concerned about large feline predators in the area. Less than a year ago, a mountain lion killed a 600-pound colt nearby. Von Badinski feels her horses are safer when they are corralled with their donkey friend Jack. And they are certainly more content when together and will call for each other when separated. Donkeys, unlike horses, are less prone to flight behaviour when confronted with a natural enemy. They stand their ground and stomp with their hooves, but before a predator can even get close, they sound the alarm with loud braying that sometimes keeps a potential attacker from making contact. Other equines aren’t the only possible companions for horses, although donkeys, minis, and ponies are quite common. You can find horses being comforted by all sorts of species, including dogs, cats, cows, sheep, goats, and camelids, like alpacas and llamas. 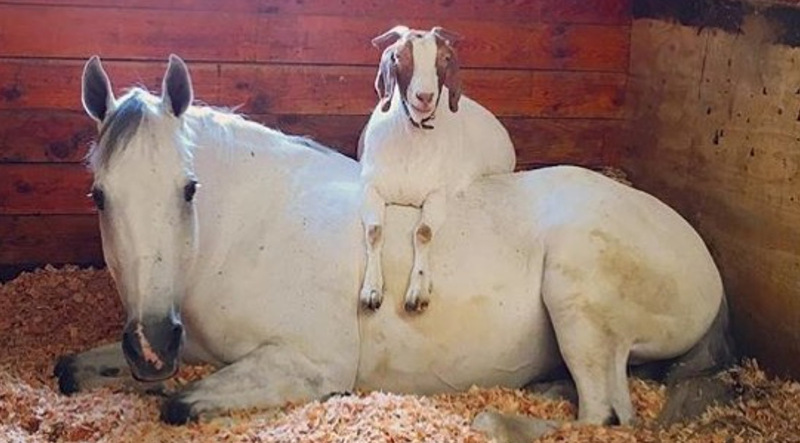 Show jumper Coaster of Legacy Hunters & Jumpers, Inc. in Woodinville, Washington, has been buddies with Buttercup, a goat, for the last six years. The two buddies are pictured below. Buttercup goes wherever Coaster goes, whether it’s to a show or a veterinary appointment, and the duo even have their own Instagram fan club. Both are owned by Legacy’s equine vet, Jennifer Sparks DVM. Different species have different learning processes. Be patient with any newcomers. 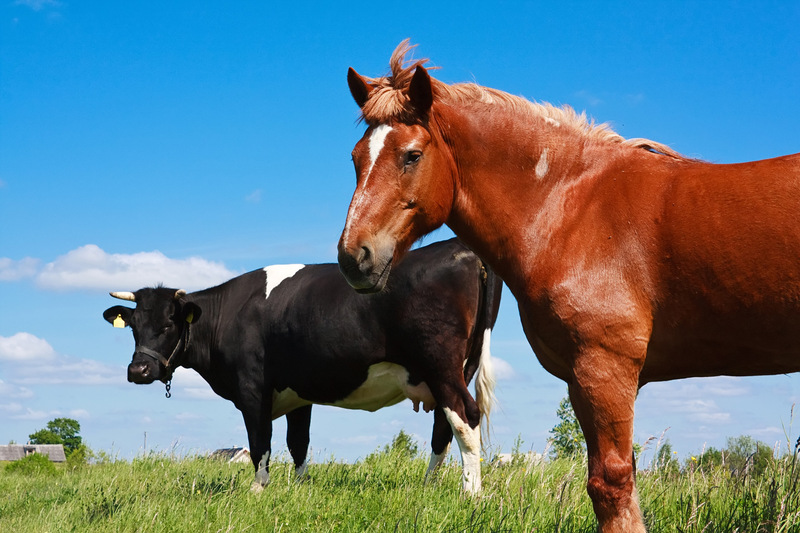 An animal that does well with your horse may react differently to other farmyard animals. Make sure to do meet-and-greet sessions one at a time with family dogs, chickens, and the like. Companion animals can have their own behavioural issues. Spend as much time as possible before bringing one home, so you can select a pal that is even tempered and won’t add to your horse’s issues. Ask if you can have a companion visit on a trial basis first to see how it goes. Don’t forget that companion animals will need vet care too, and the bigger they are, the more costly it can be. Look for a vet that is experienced with the type of animal you select, such as a farrier that knows how to do specialised trimming on a donkey’s hooves. Consider the lifespan of the animals you are matching up. Whenever possible, try to create as much overlap as possible. And be prepared to take care of a companion animal even longer than your horse. While a horse may live to be 30 years, a donkey can go 50! Watch for food competition if your horse is fed and stabled with a friend. Be prepared to feed them separately if necessary. Be on the lookout for jealousy on the part of a companion if your horse goes out frequently on its own for activities. Either bring the companion along or get a third animal, so there’s never anyone left on their own. With so many animals needing adoption these days, it may be easy to find a free or low-cost companion for your horse. Before shelling out a lot of money for a friend, check with your local rescue organizations, or you can even ask at the meat market. Maybe you’ll come home with your own Buttercup to keep your horse happy and healthy! Follow the FEI_Global on Instagram to see beautiful photographs of horses every day!